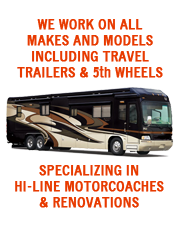 Level your RV - Over time, a stationary cooling unit operated out of level will be permanently damaged. Don’t over pack - There must be space between the foods to allow for air to circulate throughout the compartment. Install a fan – A 12 volt, thermostatically controlled refrigerator vent fan installed at the back of the refrigerator or at the top of the roof vent to assist with drafting the hot air away from the refrigerators cooling unit can increase performance up to 40%. Perform a yearly maintenance - Soot, rust and other debris can fall down and obstruct the burner assembly decreasing the cooling efficiency of your refrigerator and creating possible fire hazards.